While most fossil fuels in the United States are burned, or combusted, to produce heat and power, EIA estimates that the equivalent of about 5.5 quadrillion British thermal units of fossil fuels were consumed for non-combustion purposes in the United States in 2017. 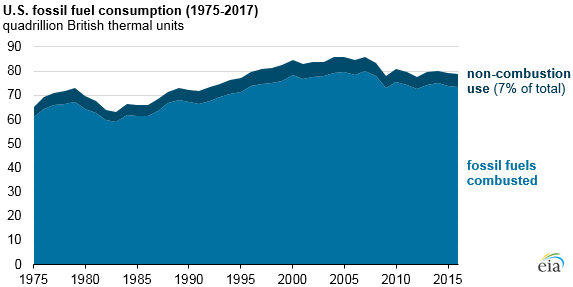 Over the past decade, non-combustion consumption of fossil fuels has typically accounted for about 7% of total fossil fuel consumption and about 6% of total energy consumption in the United States. Fossil fuels can be consumed, but not combusted, when they are used directly as construction materials, chemical feedstocks, lubricants, solvents, waxes, and other products. Common examples include petroleum products used in plastics, natural gas used in fertilizers, and coal tars used in skin treatment products. 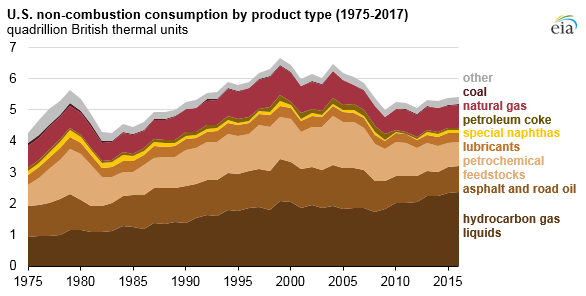 In 2017, about 13% of total petroleum products consumed were for non-combustion use. Natural gas non-combustion use accounted for about 3% of total natural gas, while coal was less than 1%. In 2017, carbon dioxide (CO2) emissions would have been 196 million metric tons (about 4%) higher if non-combustion fuel use would have been combusted. Estimation of fossil fuels for non-combustion consumption is essential to calculate total U.S. carbon dioxide emissions. In the non-combustion use of these fuels, some (but not all) of the carbon is sequestered and not included in the fuel consumption values for emissions calculations. Petroleum products account for about 86% of non-combustion consumption. Hydrocarbon gas liquids (HGL) such as ethane, ethylene, butane, butylene, isobutane, isobutylene, propylene, and natural gasoline and petrochemical feedstocks such as naphthas are important components for making plastics. HGL are used as intermediate products, while petrochemical feedstocks are used directly at chemical plants. Other petrochemical feedstocks are used to make synthetic fabrics, such as Kevlar, synthetic rubbers, detergents, and other chemical products. Many other petroleum products are consumed for non-combustion uses other than plastics. Asphalt and road oils are used for roofing and paving construction. Lubricants, which include motor oil and greases, are used in vehicles, machinery, and various industrial processes. Petroleum coke is used as a chemical catalyst, while special naphthas are used in petroleum-based paints. Other petroleum products include distillate and residual fuel oils used as chemical feedstocks as well as polishes and waxes. Relatively small amounts of natural gas are consumed for non-combustion use in the industrial sector. Natural gas is used as feedstock to make nitrogenous fertilizers and a range of chemical products including ammonia, hydrogen, and methanol. Only small amounts of coal are used for non-combustion purposes in the industrial sector. Among the byproducts of the process to produce metallurgical coke are coal tars, which are rich in aromatic hydrocarbons, such as benzene, and are used as feedstocks in the chemical industry to make sealcoats for pavement, synthetic dyes, and paints. Some anti-dandruff shampoos and other medical skin care products contain coal tars. Monthly and annual estimates of non-combustion consumption of fossil fuels are available in both physical units and energy units (British thermal units) in Tables 1.11a and 1.11b of EIA’s Monthly Energy Review.